As we mark the completion of five years in our facilities on North Avenue—and begin our sixth ministry year here—I cannot help but take time to stop and praise God for the thousands of individuals who make this ministry possible. Your giving to Wheaton Bible Church enabled us to buy this land, build this campus, and then to carry out the ministry God has given to us here. Looking out my office window, I recall how this site was transformed from pasture land to a launching pad for Gospel-powered ministry! 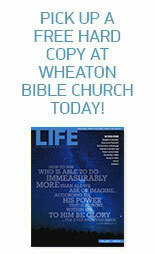 The stories in this issue of LIFE at Wheaton Bible Church represent another, far grander, kind of transformation in the lives of men and women, students, and children—even entire families—who have been touched by our church and its ministries. As you read, be encouraged by the hope and joy that are filling the lives of those sitting with you in worship services, as they are ministered to, as they volunteer, or as they give. Praise God for the opportunity we have to be part of bringing others into His Kingdom and into a deeper relationship with His Son. I urge you, brothers and sisters, in view of God’s mercy, to offer your bodies as a living sacrifice, holy and pleasing to God—this is your true and proper worship. Do not conform to the pattern of this world, but be transformed by the renewing of your mind. Then you will be able to test and approve what God’s will is—his good, pleasing and perfect will. Thank you for your faithful generosity that supports all the ministries of Wheaton Bible Church, from Children’s Ministry programs on Sunday mornings to financial assistance to those in need, from outreach here in West Chicago to support for missionaries who are sharing the Gospel —many in areas where the message of Jesus Christ faces strong opposition—around the world. This entry was posted on September 9, 2013 by Wheaton Bible Church in ALL IN, Fall 2013 and tagged all in, debt, giving.